I stepped out of my home office to get coffee, and my boy Zevon decided he'd help me grade some freshman essays. I think so, too, but I'm biased. Cats are very helpful when you are grading. The Midget Monsters assure me of that often. "Midget Monsters." That sounds like tag-team wrestlers, which they are, at least judging by the pictures on your office door. They are, for the moment, Midget Monsters (upgraded from Mini Monsters). I'm afraid to think where they'll be in size in six months. And I agree with sahlah that Zevon is gorgeous -- and I love his name. Zevon has gotten so big - he's gorgeous. What beautiful markings. 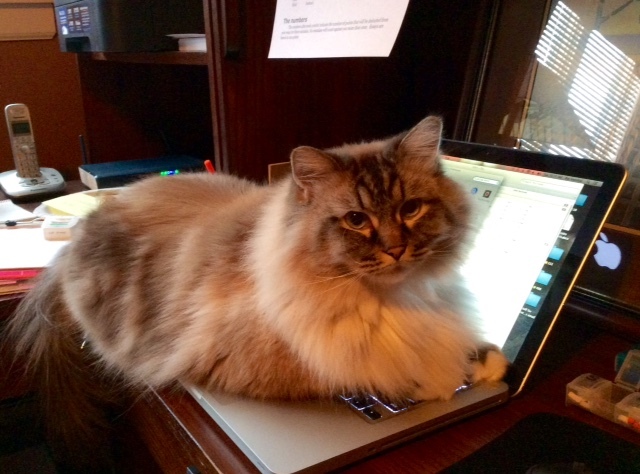 Do you suppose it's the warmth of the laptop that's appealing? Yeah, he likes to lie on my desk right beneath my lamp and on a kitchen counter right beneath some drop-down lights. We call him "George Hamilton" when he's on the counter.